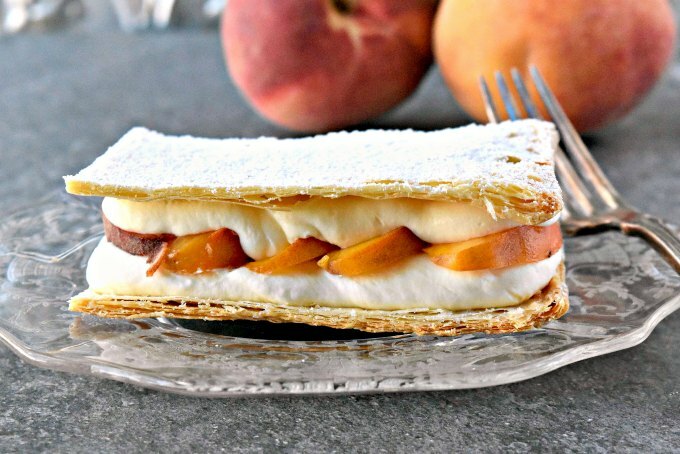 Grilled summer peaches are layered between cream and puff pastry. 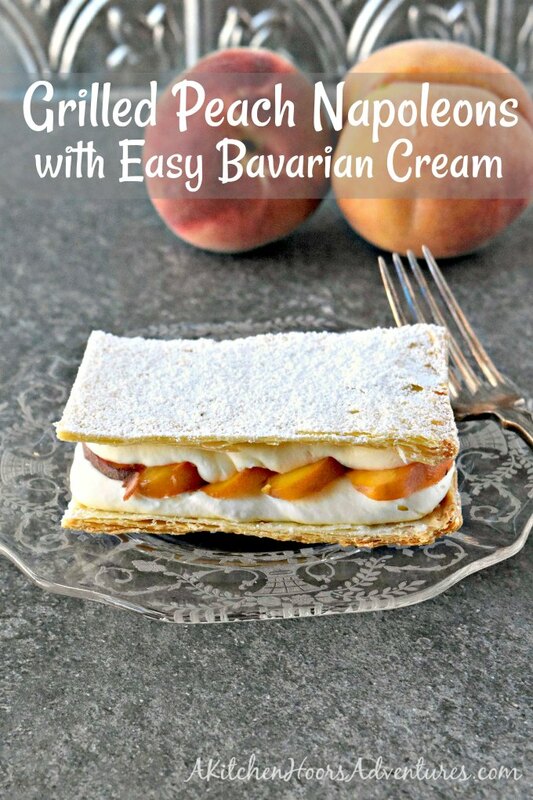 Grilled Peach Napoleons with Easy Bavarian Cream sounds fancy, but is easy. You can prepare everything ahead of time and assemble right before serving for a perfect barbecue dessert. Did y’all catch the first day of Farmers Market Week? If you didn’t, well shame on you! But that’s okay. You can read all about it in my deconstructed grilled chicken fajitas post. While you’re there you can see what the other bloggers served up yesterday. It was mighty delicious eats! I don’t know about you, but my local farmers market is loaded with peaches. Which only makes sense because we’re in the heart of peach season. I can’t walk by the bins of them and not get intoxicated with their sweet aroma. I just want to grab one, bite into, and relish that juicy peach flavor. Anyone hungry? My market has freestone peaches, white peaches, donut peaches, as well as nectarines, plums, and pluots. I’m not quite sure what those are, but they look delicious. Maybe one day I’ll get adventurous and buy a few just to taste them. But not right now. I always ask if they’re freestone peaches. For those that don’t know what that means, a freestone peach is easy to free the fruit from the stone or the pit of the peach. They come free of the stone easily. Free stone. Get it? If they’re not freestone, then you have to use a knife or a teaspoon to scoop them out, which is never very fun. Especially if they’re a really ripe peach and super juicy. Talk about a mess. It was as big as my fist. We didn’t grab near enough napkins. As soon as we bit into those peaches we were covered in juice. And it was so worth every bite. I can still remember how they tasted with their sweet peach flavor. Like, imagine a peach, and that’s exactly what it tasted like. It took me back to my childhood when Mom canned peaches. We used to pop open the can and serve them topped with cottage cheese. I really should do that again. It’s so delicious. If you haven’t tried that, you really should. Canned peaches and pears are perfect with cottage cheese. It’s a great afternoon snack as a pick me up before heading home for the day. I know, I’m sort of bouncing all over. My brain is just running with the peach train of thought while I’m on the train heading home. And I’m hungry. Which is never really a great time to write about how delicious your recipes is. It just makes you more hungry and scatters your thoughts to the winds. Basically, I’ve had a love of peaches ever since I can remember. 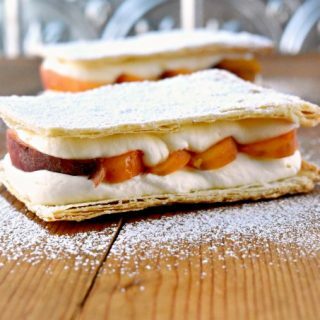 Either served on top of cottage cheese, in homemade jam or butter (peach butter is DA BOMB), or grilled and sliced in these napoleons. Summer peaches are the perfect addition to any recipe! Sweet or savory it doesn’t matter. It is, hands down, my favorite fruit. So, it only makes sense that I would highlight a delicious peach recipes for Farmers Market Week. 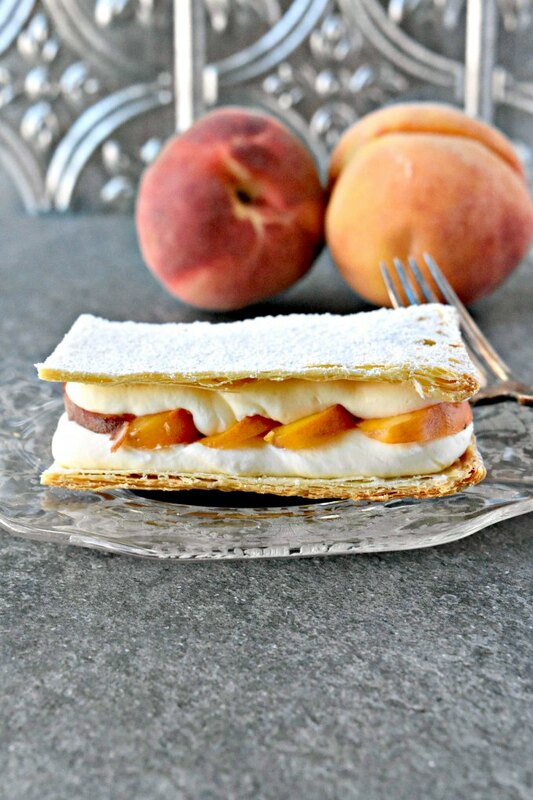 These grilled peach napoleons are rich and delicious. They have that perfect balance of flavor along with a little crunch from the puff pastry sheets. And don’t you stress none of the easy Bavarian cream. 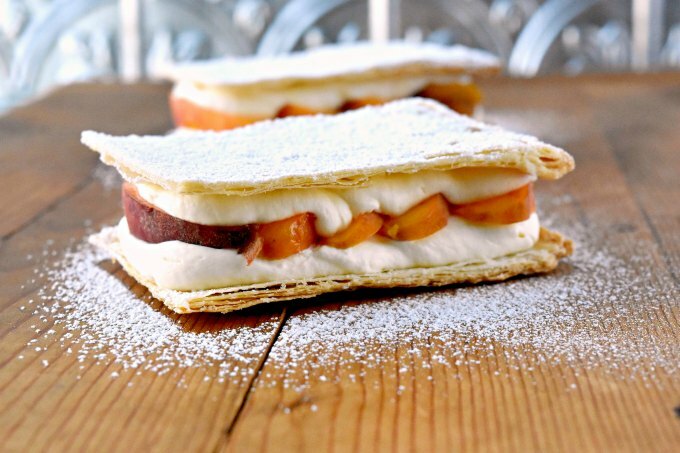 Because if you can whip cream, then you can make this super easy and delicious cream filling. It’s great for all your pastry cream needs any time. It’s just whipping cream, vanilla pudding mixture and a little vanilla extract. Granted, for mine I added some spices to enhance the flavors of the peach. Because in my head you can’t have peaches without ginger. That’s just the way it is in my kitchen. The hardest part of this recipe is the puff pastry sheets. You see, I cooked them the way I thought they needed to be cooked, but they were not easy to cut into with a fork. So, I took the ones I cooked and separated a few of the layers. 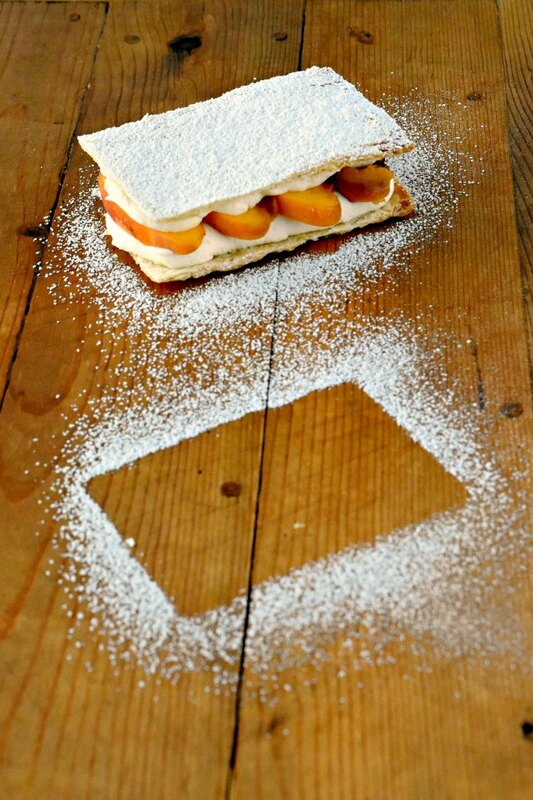 I wanted to make thinner puff pastry sheets for the grilled peach napoleons. You could easily omit the weight on the sheets during cooking. That’s totally your choice. Just warning ya that it will puff up pretty good, so you might want to put something to weigh it down a little bit. I didn’t make the first sheet with something on top, but checked it about 10 minutes in and decided to put something on top. I mean, it’s not going to hurt having to test the recipe a few times to see what works. It’s a small sacrifice eating the reject puff pastry sheets. And that’s what you’re going for! You see those little layers in the pastry? That’s a classic part of the Napoleon or millefeuille. Which basically means a thousand leafs. Not, it’s not really a THOUSAND! Maybe at one point in history it was? Though I can’t imagine. Then there’s a layer of the easiest Bavarian cream I’ve ever made. And it’s addictive. Just warning you! Then a layer of deliciously grilled peaches. The smoky flavor and the peaches are scrumptious together. Then another layer of cream and puff pastry. Now, the only problem I have is picking which of these delicious recipes to try first! Make sure you see what the rest of the bloggers are serving up for today! So much fresh, delicious goodness! Using a fork, pierce the puff pastry all over. Turn the pasty over and repeat. Place the puff pastry on a baking sheet lined with a silpat. Top with a piece of parchment and a smaller baking sheet to keep the puff pastry from puffing up while cooking. Bake at 350 for 10 minutes. Remove the pan and the parchment and cook an additional 15 to 25 minutes. Allow to cool completely. Combine the heavy whipping cream with the vanilla pudding, vanilla extract, ground ginger, and ground cinnamon in a large mixing bowl. Using the whisk attachment, beat until soft peaks form. Spoon the cream into a piping bag fitted with a 1/2 in tip and refrigerate until ready to serve. Slice the peaches around the pit. Remove the pit and brush the peaches with olive oil. Grill 3 to 5 minutes. Cool slightly before slicing. Carefully cut the puff pastry into three strips and then cut each strip in half. Using a paring knife, carefully split each piece of puff pastry in half. Place on piece of puff pastry on a plate. 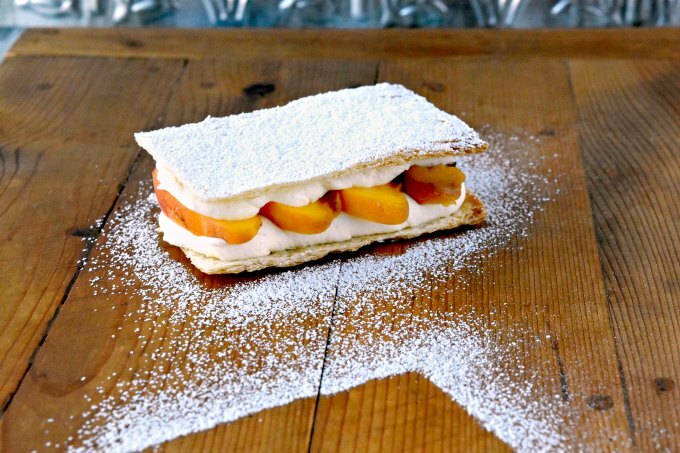 Pipe some cream on top, top peach slices, then more cream, and another piece of puff pastry. Sprinkle with powdered sugar before serving. That looks absolutely scrumptious. I couldn’t wait to see how you made it and it sounds easy enough! It definitely is! I hope you try it. This looks so elegant! Perfect for a summer dinner party! 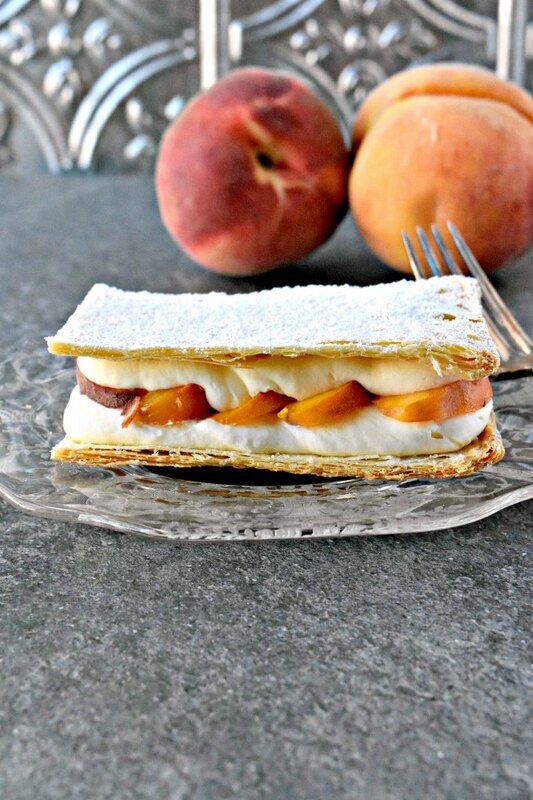 This looks so delicious, such a great way to show off some peaches with minimal effort. For sure! And summer peaches DO need to be shown off. They’re so delicious. Gosh, I’ve forgotten all about peaches and cottage cheese! What a memory. This Napoleon is amazing. Thanks for all your hard work on this week. I am totally team cottage cheese!! I’ll be making it again, soon. 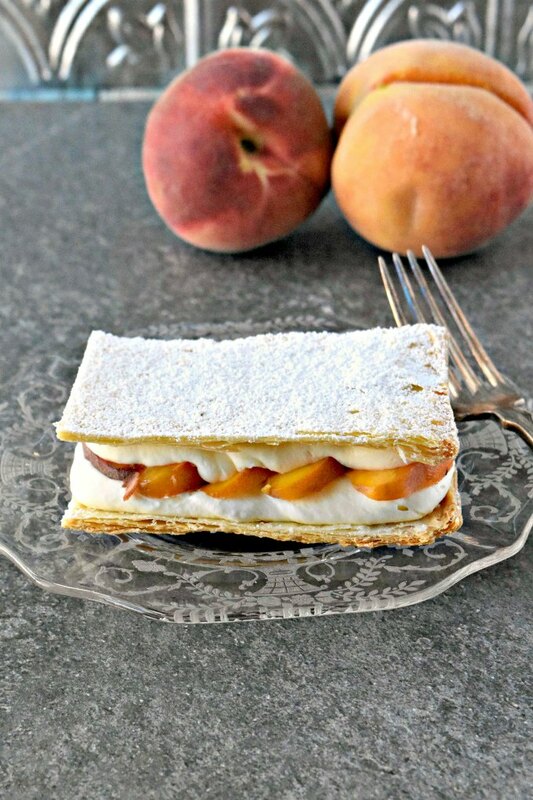 I love peach desserts and this one looks quite elegant and fresh. And on the subject of canned peaches- my grandmother used to make spiced peaches and now I am hungry for them! Mmmmm spiced peaches. I bet they were delicious. I love Napoleons. To eat, of course, but also to serve because people are always so impressed. They do make for a great table presence.